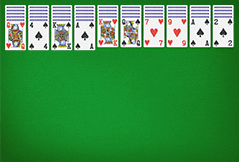 The game of Spider Solitaire is played by one person only and belongs to the category of Solitaire games. 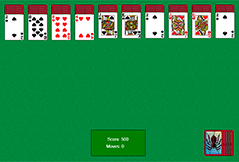 The game has 3 levels and 2 packs of playing cards are dealt in total. 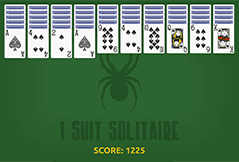 The aim of Spider Solitaire is to sort all cards and to form columns in descending order - from the king to the ace - of the same suit. Once a column is complete it will be removed from the tableau. 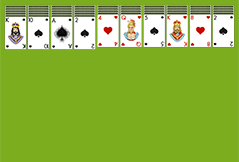 If all the cards are cleared by the end the player has won. 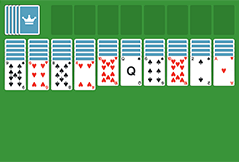 We have brought together the best free online Spider Solitaire games on this site, and added lots of information about the game itself, there is a section on “How to play Spider Solitaire” and we tell you all about the history of the game. Devotees believe this Windows version of the game is the best.. 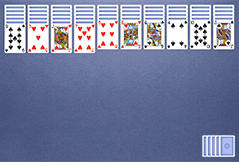 This version with large cards was created following expressions of.. 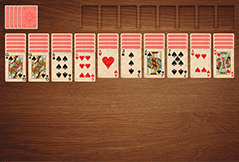 This brain-teaser has lifelike cards and an attractive wood look and..
A great game for beginners: you play with one suit, so you don't.. 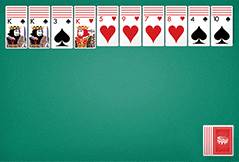 Complete the game before the counter reaches 0 or you've lost.. Choose from the 3 different levels and try to get the best score in.. This game may well look simple but that means it responds extra..
For more of a challenge have a go at 2 Suits, it's twice as difficult.. 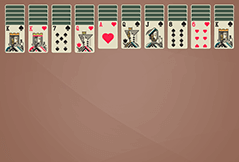 This Solitaire card game has a fresh look and appealing images..